Almost gone are the days of paper medical records. 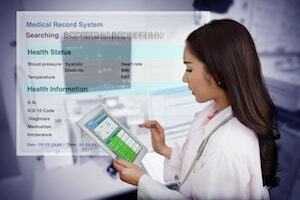 Today, many if not most, medical offices and hospitals have transitioned to Electronic Medical Records (EMRs) or Electronic Heath Records (EHRs). EMRs are the digital equivalent of paper records or charts at a clinician’s office. The digital records often contain general information on one’s treatment and medical history. Reducing costs through decreased paperwork, improved safety, reduced duplication of testing, and improved health. The medical community feels it’s about busy work and optimized billing, not patients. Electronic records are creating more work for doctors and taking longer to complete. There is too much data, lack of data options, junk data, and data errors (misfiling of patient data), which can cause costly errors and even patient injury or death. Medical professionals are becoming coders and are no longer actively listening to their patients, which is necessary to diagnose and treat their patients. EMRs are also causing burnout and resignations in the medical community. Still, others have yet to embrace electronic health records, but have met their obligations of installing the technology. According to a Northwestern University study, physicians with EHRs in their exam rooms spend one-third of their time looking at computer screens, compared with physicians who use paper charts who only spend about 9% of their time looking at them. According to a survey released in 2016 by Healthcare Information and Management Systems Society (HIMSS), a health IT trade group, only 29% of physicians report positive benefits from electronic health records. And an American Medical Association (AMA) survey found that nearly one-half of physicians report implementing the technology has resulted in a higher costs, lower productivity and reduced efficiency. Many in the medical industry believe that regulation (HITECH ACT), EMR manufacturers, rapid technology advances, and their lack of involvement in the design process are the major sources of the problem. They state that tools are not integrated and that EMRs take them away from their patients. They want the medical community (hospital administrators, physicians, nurses, documentation specialists, and transcription experts) to work together with the EMR manufacturers and vendors to try to improve the user interface, the workflow and patient experience. Many in the profession would like to see an evolution to voice recognition to reduce administrative burdens, improved content management system to balance structured and unstructured data, integrated systems that can talk with each other, and establishing an expert process for document editing and transcription. As the Patient, make sure that your physician or healthcare provider is truly spending their time assessing your health issue and not buried in new required technology.